In the Caribbean and particularly in Trinidad home made hot sauce is everywhere. Its on every table along with ketchup and mustard. In fact to most visitors surprise, even well known international brands provide hot sauce for customers. Go into KFC or Pizza Hut and you will be handed a sachet of hot sauce with your pizza or chicken wings. But this daring move is right on point. More and more people use home made hot sauce locally and of course a venue like the GSC gets visitors from all over the world who are used to having and using hot sauce and will be happy to try a “locally made” hot sauce just like they love locally sourced ingredients. 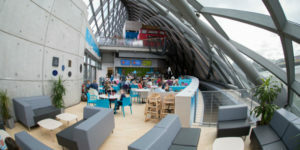 in fact the Café in GSC makes a tremendous effort to use as much Scottish produce as it can put on the table and that’s good for the visitors and for local business and for Scotland. Its what Scotland Food and Drink is all about.